- illstr., facsims., genealog. table, maps, plans. The theme "the new-born child in a small boat of woven rushes floating on the Nile and recovered by the king's daughter" is known as one of the most popular stories in connection with Moses. A less-than-critical reading of the Moses stories in the Bible can lead us to believe that an accidental foundling, the infant Moses, was fortunate to have been discovered and brought up by a princess. In reality, the episode with Moses in the little boat on the water is an example of an "internationally" widespread cult-ritual for designated crown princes before and after the time of Moses, although the Bible in its present version may leave the impression that Moses' experience was unique and almost a "miracle". Stories of a new-born child found in a boat floating down the River Euphrates were already known from Babylon almost a millennium before Moses' time, where a boy-child - later to become the king named Sargon (Sargon I) - was found, brought to the king's palace and given a high education; (cf. Appendix 1). According to his so-called 'autobiographical' record, this child (Sargon) in the rush boat was the son of the king's daughter. No foreign child of low birth could have obtained such a significant education followed by a royal career. Thus, it must have been a thoroughly planned happening intended for a child of royal origins. A similar cult-ritual is related in ancient Scandinavia, where a young boy-child - "sent by the gods" - arrived alone in a boat floating on the water. This too describes what must have been a staged happening, since "all the people who received him on-shore immediately knew that the child was to be the country's future king". This child was later to be known as King Skjold ('shield') of Denmark, the progenitor of the Skjold-children's dynasty, who lived at the royal seat of Lejre. King Sargon is the earliest known case of this ancient ritual for royal children: - "a new-born child sent by the gods in a small boat on the water, recovered and brought to the king's palace by the king's daughter (and later was to become king)" - while the case of Moses is the most famous. There have been numerous other cases since it was a widespread royal tradition and in addition a prestigious, religious custom. The last known and in many ways similar case is about the Dalai Lama; and even in connection with the old Tibetan Bön religion where the Tibetan god, Pe har, had assumed a form of a boy and was placed in a box drifting down the Kyichu river and was then picked up by high-ranking lamas or abbots, or by the Tibetan leader, the Dalai Lama himself. In ancient Egypt, the pharaoh was considered to be a god, and thus the pharaoh-son to be the god-child, Horus, who was recovered by his mother, the goddess queen Isis, from the little vessel in the reeds or bulrushes, on the Nile. In addition to King Sargon I found on the Euphrates (ca. 2300 BC) and Moses found on the Nile (ca. 1500 BC), it is known that Erechtonius, the first Athenian prince (ca. 1400 BC) was found in the water on the coast; and that the Greek "god-child" Dionysus - born of King Cadmus' daughter Semele - was found in a little boat riding the waves near Brassiae in Laconia. Another Greek "god-child", Attis, was received on the banks of the River Sangarius by the mother-goddess Cybele. However, many scholars have too easily dismissed these cultic traditions, places, and persons as being myths and fairytales. But in the 1950's, the burnt ruin of Cadmus' royal palace was found by archaeologists, and likewise in Denmark in 2004 the royal palace in Lejre was found. Thus, both sites are scientifically dated, proving time and location correct and disproving these as being myths only. Moreover, the Mycenaean (ancient Greek) linear-B tablets prove that the name Dionysus was known ca. 1500 BC. In India the Sun-god's son, Karna, the Prince Royal, was placed in a woven reed boat by his mother, the king's daughter Kunti; as similarly was the Babylonian Queen Humar's son set out on the Euphrates to be received and recognized as heir to the throne. The Latin King Romulus was found on the River Tiber (ca. 800 BC); while King Tu-Küeh of the ancient Turkish people was set out on the water at Turkistan (ca. 200 AD). As with King Skjold ('shield') - also known as King Sheaf - on the Roskilde fiord near the settlement Lejre, in Denmark. The same ritual was held not only for King Arthur on the Cornwall coast (all ca. 600 AD), but also for the Celtic kings' children on the Rhine; and it even appears in ancient myths in Tibet (within the Bön religion) and Japan (the new-born son of Izanagis and Izanamis was set out in a woven rush boat). And the ritual was also known to be associated with high leaders of the (early Asian influenced?) North-American Tlatlasikoala-, Tsimschian- and Tlingit-Indian tribes. Even much later, this tradition or idea may be identified demonstrating its widespread occurrence. For example, all over the south of France the tradition of Mary Magdalene arriving on the coast of Provence is still well-known. The place, later a city, is named: Les Saintes Maries de la Mer. It was normal in the 1st century AD that Jewish refugees escaped to southern France, for instance the 'famous' Jewish ex-king Herod Antipas. Some Christian texts of Antiquity together with partly secret legends tell us that Mary Magdalene was Jesus' wife and most preferred disciple. In addition that she carried their unborn child, thus of "royal blood" (cf. royal ancestors of Jesus, in the New Testament), on her arrival to the coast "in a boat without sails and oars", where they were picked up and helped ashore. The event where Moses was received with the ritual for the chosen royal child indicates him as being an Egyptian - the Israelites had no kings until 500 years later (Saul, David etc.). In any case, the Moses episode in the Bible seems actually to describe a cult ritual for the initiation of royal children chosen to become heirs to the throne. In Egypt, occasional fragments of this royal ritual are well-known (see chapters 4 and 14, and cf. the Egyptologist H.W. Helck below in the present chapter), but in less detailed form. Also the fact that Moses went through this ritual, of which also minute details can be recognised in the Bible, and was then for some time placed with a wet-nurse, conclusively speaks for Moses as being the child of Pharaoh's Daughter. It was a normal practice that royalty used wet-nurses for their children. Thus the previously mentioned Hatshepsut, at that time a very young Pharaoh's Daughter, seems to have similarly arranged for her child to be briefly "returned" from the wet-nurse's-care to partake in the ritual. The Mystery Play: a Key to Ancient World Concepts! In ancient society, mystery plays or cult-dramas had an extremely important function. Today, it is easily forgotten how much a "religious" attitude penetrated the cultures of the ancient world, and how much attention these cult forms received. Religion, mysticism and cult were all blended on a high level and influenced most daily activities. In the profane world, one strove to re-live the myths of the gods - for instance, when the king himself was made to catch a dangerous animal while hunting, this was believed to reflect the gods' victory over the powers of chaos. Throughout most of the ancient world in the Middle East and India, mystery plays were practiced. Later, other forms could be found in the secret society like "the eagles" of the Mayas in Central America - and even some parallels could be seen regarding the mysterious "leopard men" in West Africa. Real mystery plays still exist, especially in the contemporary Masonic lodges, when for example connected with their different steps of the initiation ceremonies. In the ancient world the more or less secret cults with their sacred rituals and other special ceremonies where the secret mystery plays were also practised were an "international" phenomenon. This in principle reflects a homogeneous form of cult-practice and an equivalent unified core of religious-philosophical ideas in spite of all the external differences. In the Bible's original Hebrew text about the "ritual episode" with the infant Moses on the river Nile, we find that key words in the story - bulrushes, papyrus, Nile, riverbank, etc. - are not Babylonian but in fact ancient Egyptian words. Some of the forms of development taken by the mystery plays (as mentioned in detail in later chapters) follow directly from ancient Egyptian texts. Many of these were translated by Kurt Sethe, the German Egyptologist, in his "Dramatische Texte zur altägyptischen Mysterienspielen" (Leipzig 1928). Several authorities depict the mystery plays associated with throne-inheritance rites: inter alia, Egyptologist Alan H. Gardiner, - and Henri Frankfort in his book "Kingship and the Gods" (Chicago 1948), and in H.W. Fairman & S.H. Hooke's dissertation "The Kingship Rituals of Egypt" (Oxford 1958). An impression can still be given concerning the importance of this part of culture in Ancient Egypt through the many traces of ancient mystery plays in the late middle ages. For instance, the crowning rituals of the kings, in commedia dell'arte, in the crib- and passion plays of the church, and also in the ceremonies of the freemasons. Archaeological finds of the priests' great god-masks for such plays in Egypt are also well-known. Theatre-playing in Europe has its origin in these mystery plays via Greek tragedies and satires, and from the mystery plays they have continued the tradition of using masks and costumes, especially those of gods and demons. Elements of the mystery plays, which seem strange today, can be recognised in many significant situations of Moses' life, and are also recorded in the Rabbinical Writings and other ancient texts. It was, of course, possible for power-seeking rulers and competing branches of the royal family to abuse the situation when a new-born prince and heir to the throne went through the ritual of being set out in a boat, thereafter to be received by high-seated persons, taking the opportunity to get rid of an unwanted heir. The child could then be removed under cover of this rite or by arranging an accident during a ceremony. Some of these practices are also hinted at in several myths; yet again some of the incidents are but witness to the tribulations the child had to go through via the mystery plays, since at the same time the rite was perceived as a consecration of the child as "the chosen one". These trials originated from earlier, often more brutal, traditions where the survival abilities and "power" of the king's child were tested by literally life-threatening methods; for example by setting a child out on the water or in the wilderness. In other cases, on the contrary, the goal was protection of the child e.g. by reporting the child lost, while at the same time having arranged in secret for childcare by strangers in a hidden place far away. Throughout history the practice of the more or less secret cults with their mystery plays was exercised by royalty, the highest ecclesiastic persons, the nobility and aristocratic families. For example, at Hagia Sophia, a Byzantine emperor, a queen and an heir to the throne all played the main characters in frequently performed ecclesiastic mystery plays dealing with the birth of Jesus. The story in the mystery plays connected to a newborn royal-child's first consecration - as protection against evil influences - is retold in the Brothers Grimm story about the Sleeping Beauty. Three fairies (originally goddesses) came to the newborn child, offering magical cradle-gifts. However, one of the fairies took the opportunity to achieve her own mischievous purpose - still within the rules of the game. Even this twist in the plot has its origin in the content of the mystery plays, where a suitable balance from an "opponent" was always sought for - not necessarily by compensating for the good gifts with something bad, but for example by giving rights together with duties. Thus the reception of the three-month-old Moses by the women of the royal house dressed as goddesses, had also been performed within a cultic mystery play, whereafter, like the act of the fairies, the child was endowed with royal attributes such as wisdom, strength, beauty, devotion etc. Such mystery plays with "good fairies" (goddesses) at the birth of the heir to the throne, relating to early Egypt, can be found in "Papyrus Westcar" from the times of King Cheops, ca. 2550-2525 BC. To be able to better understand what actually happened on this special occasion when the princess received Moses from the Nile, some well-documented early Egyptian conditions must be taken into consideration. In ancient Egypt, religious processions often included taking statues of gods out of the temples, dressing them in special costumes and then carrying them in chests/coffins (in some cases known as 'fdt-st3t, 'cista mystica' ), in processions, with halts on the way in certain places. Here the escorting priests and audience could praise, intone hymns, genuflect, or prostrate themselves to honour the gods. Similar religious practice is known from ancient Babylon and later also with ancient Roman gods. In principle it is still to be found, 3,500 years later, in the Catholic Church, where statues of saints are dressed and carried along certain routes, also having special stops at "stations" on the way for genuflection, supplication, and prayer. Instead of using likenesses of gods, i.e. figures, statues, pictures, these religious rites could also be expressed by certain persons dressed as gods acting out the gods' part - and that is exactly the practice characterizing the mystery plays. 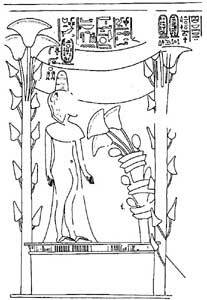 In Egyptian temples and tombs frequent illustrations are found showing human figures dressed as gods. A form of religious procession, used on numerous occasions, was carried out by sailing on the Nile with different gods - also here often in coffins placed on the boats - which thereafter were received on the east bank near the Amun(-Re) temple close to the palace in Egypt's then capital No, i.e. Karnak/Luxor - 680 km south of present Cairo - more precisely in the northern part (Karnak); the town and place which was later called Thebe(s) by the Greeks (from Greek taibe, 'ark/chest/coffin', thus related to Egyptian debet). The traditional narratives about royal children who were "sent by the gods", like Sargon, Romulus, Skjold etc. - and thus also Moses - and who from their special boat were then taken up by the king's daughter and brought to the royal house, clearly were arranged mystery plays. All the aforementioned children who went through this ritual were brought up to become kings - and according to the Rabbinical Writings and several ancient writers, this has also been the case with Moses. An important element in Egyptian religion is also seen in the many religious processions where gods (statues) in chests/coffins were transported, e.g. the traditional religious teaching about the mythological king-god Osiris, who after his death was laid in a floating coffin. (Likewise the rabbis describe the little boat of Moses as "the little ark" on the Nile). From this ark, the king-god was then to be revived, with the help of the goddess Isis, in the image of his and Isis' newborn son Horus, a god-child that was to become the new king. In other words - again, exactly like Moses. In this Horus-myth an important feature was that Horus' mother, Isis, appeared together with her twin sister Nephthys, the goddess, so that the god-child, Horus was conceived by Isis and "born", in a figurative sense, by Nephthys. Therefore, the delivery was painless - but the ambiguity was understood and reported so that in reality Isis conceived him, and yet another sister of Isis, Hathor (the goddess of the sky), nursed him. In the study of Egyptian theology and mystery, this ambiguity could be perceived as if the child went through a physical as well as a spiritual birth. The same line of thought is later seen in some of the old Christian and Christian-inspired sects, for instance the Gnostics in Egypt (and also with Rudolf Steiner in more recent times), where Jesus too is connected with this religious idea of having two mothers, a physical mother and a spiritual mother. 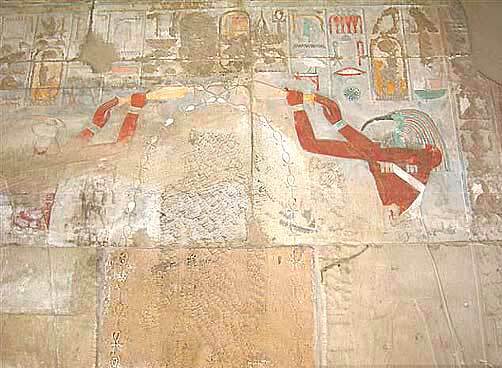 Likewise, some of the mythological pictures of the Deir el-Bahari temple, for example, deal with the birth of Hatshepsut, showing her as a newborn child in a similar dual form, where she is depicted as two identical king's children - one of which personifies her ka, or soul. From the written records as well as from historical knowledge of the ancient Egyptian relations, it is possible to reconstruct the structure in this mystery play, where it will appear that Moses acted as the divinely born Horus-child, the new king, who arrived on the Nile in Osiris/Horus' ark. This "container" was no ordinary rush basket - the Hebrew Bible explicitly states that it was a boat woven in papyrus, and was "an ark", i.e. shaped as a rectangular chest or coffin with a lid, in Hebrew theba, an equivalent of the previously mentioned Egyptian word debat (debet): 'ark', 'chest', or 'coffin' (later taibe in Coptic and Greek). It was such chests/coffins - though mostly made of wood - that were used by the Egyptians for storing statues of their gods at ceremonies. The ark of the Moses child, made of reed (bulrush, papyrus) was sealed with zefeth, Hebrew for 'pitch' - originally an Egyptian word from the time of Hatshepsut: sifet, an oil-product either as 'pitch', or as 'oil-ointment' especially used for preparing the dead in the coffins. Modern research has discovered traces of pitch in the mummies, and that the pitch normally being used was imported from Canaan (cf. "La Recherche", février 1990). Of the Bible's different words for 'pitch', the use of the word zefeth in the texts about Moses is to be connected with the coffin/ark of the Osiris-ritual. From this special boat - the floating, woven coffin - Moses was consequently received by his mother Hatshepsut, who, since she was Pharaoh's Daughter, performed the role of the mother of the god-child, Horus, the goddess Isis in this mystery play. 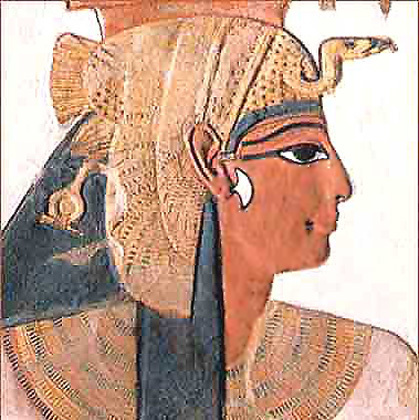 In addition, Moses was supplied with a nurse, who correspondingly filled the role of the goddess Nephthys. Royal nurses were recruited from families of great reputation - as one example, the later pharaoh Tuthmosis III made his nurse's daughter, Sat-iah, his chief wife long before he married an Egyptian daughter of the king. It is also a well documented situation that in the era of the kings of the 18th dynasty - and hence in the time of Hatshepsut - it was a tradition that the nurses at the court were ladies-in-waiting who were married to high ranking officers and who had special connections with the king. The aforementioned German Egyptologist, Hans Wolfgang Helck, explores this issue in two of his treatises (cf. Bibliography: group 9a), "Der Einfluss der Militärführer in der 18. ägyptischen Dynastie" (Leipzig 1939) and "Zur Verwaltung des Mittleren und Neuen Reiches" (Leiden 1959). Furthermore, such an upbringing must be seen in relation to the fact that the Rabbinical Writings and also several ancient writers mention the young Moses as already having great abilities as a general and a military tactician in the service of the then ruling pharaoh. "... the woman was told to 'be a nurse' to him, but not breast feed him ...". Several Rabbinical Writings also mention that this wet-nurse and (surrogate) mother "delivered without pain". This is in total correspondence with her role in the mystery play as the goddess Nephthys who was also nurse, reserve mother, and "delivered without pain" since she is not proclaimed as the biological mother of the (Horus) child. In accordance with Hans Wolfgang Helck's "Twk und die Ramses-Stadt", in Vetus Testamentum (vol. 15, Leiden 1965), the motif of the episode in the Bible is just as Egyptian as it is Semitic. 1. The pursuit of the child: - is mentioned already in "Papyrus Jumilhac" (VI, 9). 2. Which text also refers to Nephthys as: - "the sister, who watches in the bulrushes". "... he (the Horus-child) sails in a reed boat, and then Isis said, 'let me see my son that is hidden in the bulrushes' ...". 4. The pharaonic child on the Nile is delivered by the god: - this is directly to be read in the inscriptions about Egyptian kings (more details in chapter 14). 5. That a mother with royal connections, as in this case Pharaoh's Daughter, thus "taking over" her child, is a known ritual: - "adoption of pharaoh" (see chapter 4). According to the information in the Bible, the woman that nursed Moses was a Levite; in later Jewish tradition, she was generally perceived as belonging to a Hebrew tribe of Levi. However, much seems to indicate that in Egypt, most of these Levites actually were Egyptians originally (more on this in chapter 6). As a starting point it was not unrealistic to presume that Moses' nurse could be of Egyptian origin, possibly slightly "Levitine"; or even more foreign, a Hebrew. Compare with the fact that as late as in the 1860's, rich white Southern State, Americans entrusted their children with nurses selected from among their slaves. But the Book of Exodus (2:9) mentions that a woman was paid to nurse the infant Moses. Thus, as opposed to servants and slaves, she was a paid employee of the Pharaoh's Daughter, which, at the Egyptian court, was a practice with ladies-in-waiting; and according to the Bible as well as the Rabbinical Writings, the woman who nursed Moses already had two children. "… And when she (Moses' mother) saw him (the infant Moses) that he was a goodly child, she hid him three months …". Egyptologists have demonstrated that special circumstances existed when Egyptian royal children were born - forming part of a cultic ritual. These births took place in special huts or tent-structures often erected on the roof of the palace or temple - according to, e.g. the German Egyptologist Emma Brunner-Traut's treatise about 'vigil-huts': "Die Wochenlaube", in Mitteilungen des Institut für Orientforschung (Band 3, Berlin 1955, pp. 11-30). The mother could, in this childbirth-pavilion, "hide the child" in isolation from the public during the first period after birth, "protected from danger" according to "Papyrus Westcar" - exactly as stated in the Bible. Since most mothers would probably think that their child was good-looking, there must be another meaning of the expression 'good-looking' ('goodly') found in the biblical text. In Egyptian, this expression is absolutely logical - as no word for 'good' existed as a moral expression - but was the word nefer (nfr), which in "humble" translation means 'good or beautiful (in appearance)' and was mostly used in referring to kings and gods, and meant 'royal radiance', or 'divine radiance'. - which is in harmony with the fact that the god-child, Horus, traditionally also was connected with the sun. These conditions must be seen in relation to the previously mentioned tradition where goddesses (like the fairies) gave the god-king-child "magical" crib-gifts of such attributes. This mystery play was a sort of theophany, '(first) appearance of the god', and is later known also by the church. It now appears to be a reality that all the traditionally prescribed rites were included in the episode with Moses. In this book the use of such even generally accepted procedures is referred to as a starting premise by means of which evidence of customary practices and rituals are treated as being relatively true, as long as they are not proven false or unreasonable (i.e. as a useful, provisionary working hypothesis only and not seen as a fixed proof). This has proved to be more plausible than assuming beforehand that almost anything, in principle, in the ancient reports is not true before it has been established. This present method was also used by several archaeological authorities like Cyrus Gordon, Yigael Yadin, and especially W.F. Albright who introduced stringent standards into biblical archaeology, making it more scientific and acceptable. Evaluations made by them for which they were especially criticized, were often cases where they had deviated from using this present method. It has now been shown above that several parts of the Biblical texts and Rabbinical Writings in question are relatively correct reports - also concerning ceremonies on the Nile - and seems to be in logical agreement with Egyptological knowledge. This strengthens the historical certainty of the essence of the ancient reports - not necessarily as "hard evidence" about the "truth" of the Bible, but shedding new informative light on its content. - Examination of several ancient Middle Eastern ceremonial performances which resemble the episode with Moses, has shown that this special procedure could only be related to royalty and was an "international" tradition for royal children as heirs to the throne. This implies that Moses must also have been a royal child when in the first place thus able to partake in this rite. - The ritual for the royal child was arranged as a mystery play. 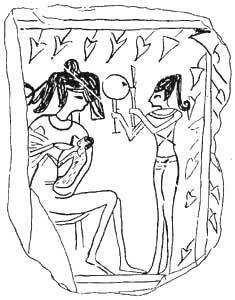 In the Egyptian version, this meant that one of the participating women acted as the royal child's wet-nurse. This fits in with the biblical mention that Moses' nurse was paid, and again that the nurses of the royal house in Egypt were not serfs or slaves but were attached to the court as ladies-in-waiting. The Delivery Hut, protects a new-born baby. The traditional draping with bindweed had a special meaning. Right: Royal delivery hut with bindweed and covered with tent canvas, and having the picture of a princess inserted. Both from the 18th dynasty. Below: Ritual bathing of "Pharaoh's Daughter" (now meticulously hacked away) in holy water being poured out as vitalising ankh-streams from temple vases by participants dressed up as gods. Relief from Hatshepsut's chapel in Karnak. The references and bibliographical sources already mentioned or skimmed in the text of the Chapter Two, are also presented here below - all beeing gathered. - - : Moses in Historical and Theological Perspective, "Magnalia Dei: The Mighty Acts of God", (ed. Frank M. Cross et al. ), Garden City 1976. - - : The Biblical Period, Oxford 1952, pp. 8ff. Baring-Gould, S. (ed. ): Moses..., in "Legends of Old Testament Characters from Talmud and Other Sources", (vols. 1-2), London 1871, vol. 2, p. 74. Brunner-Traut, Emma: Die Wochenlaube, Mitteilungen des Institut für Orientforschung, Band 3, Berlin 1955, pp. 11-30. Fairman, H.W. : The Kingship Rituals of Egypt, - in: Hooke, S.H. (ed. ), & H.W. Fairman & H.H. Rowley & Geo Widengren et al. : "Myth, Ritual and Kingship, Essays on the Theory and Practice of Kingship in the Ancient Near East and in Israel", Oxford 1958. Frankfort, Henri: Kingship and the Gods, Chicago 1948. Ginzberg, Louis (ed. ): ("Moses" in) The Legends of the Jews, (vols. 1-7, Philadelphia 1909-1938), - vol. 5, Philadelphia 1925, p. 399. Gordon Cyrus H., & Gary A. Rendsburg: The Bible and the Ancient Near East, 4th ed., New York 1997. Helck, Hans Wolfgang: Der Einfluss der Militärführer in der 18. ägyptischen Dynastie, Untersuchungen zur Geschichte und Altertumskunde Aegyptens, Band 14, Leipzig 1939. - - : Twk und die Ramses-Stadt, Vetus Testamentum, vol. 15, Leiden 1965. - - : Zur Verwaltung des Mittleren und Neuen Reiches, Leiden 1958. Lewis, Brian: The Sargon Legend: A Study of the Akkadian Text and the Tale of the Hero Who was Exposed at Birth, ASOR, Diss. Series, vol. 4, Cambridge, Mass., 1980, pp. 1-10. Magazine: Poix en l'Egypte ancienne, "La Recherche", février 1990. Philo, (Philo Judaeus of Alexandria): De vita Mosis, I-IV, Loeb Classical Library, 6, London 1935. Redford, Donald B.: ("Moses" in:) The Literary Motif of the Exposed Child, Numen, 14, 1967, pp. 209-228. Sethe, Kurt: Dramatische Texte zur altägyptischen Mysterienspielen / Der dramatische Ramesseumpapyrus: ein Spiel zur Thronbesteigung des Könings, Untersuchungen zur Geschichte und Altertumskunde Aegyptens, Band 10, Leipzig 1928. Yadin, Yigael: Is the Biblical Account of the Israelite Conquest of Canaan Historically Reliable?, B.A.R. (British Archaeological Reports), March-April 1982. The Bibliography is the so far most comprehensive collection of books, articles, and other non-fiction texts about Moses. The collection, through many years build up by Ove von Spaeth, has been used for all his 5 volumes on research of the historical Moses. The supplementary sources in the Bibliography, especially about Egyptology, anthropology, history of religions, archaeology, and astronomical dating are contributing to a necessary interdisciplinary, general survey - and establishing a major co-ordinated connection in a greater scale than otherwise possible. Last update of the presented Bibliography: January 2005. Although some of these may be of an earlier date, they are all to be found in the libraries, and many have been reprinted, or others are even presented on the Internet. It has often been a somewhat automatically, general practice to anticipate that the latest published research books/papers almost inevitably also has to be preferred among the best. This is an unqualified underrating of the foundations hitherto. Instead, in the present book-series on the historical Moses, the only reasonable procedure has been to use the best of recent information as well as the best of the scrutinized earlier date materials. In addition, in order to meet the questions or doubts often raised in connection with the new-orientating knowledge on the historical Moses, a generally less known or inspected group of evidences of authenticity is gathered here: Genuine Egyptian Source Documentation on Moses. Also, cf. documentation on the historical dates: A More Precise Dating of Moses. Also, it may be preferable to read succeeding Chapter Three to be familiar with further, significant documentation. - credentials, statements from a number of scientific experts and professionals are presented in the section 1 of the website page containing introductions to Vol. 1. - information through further credentials concerning authorship, research, and the entire book-series can be found on these pages: authordata-4, Reflecting Views and Zenith IC Project. ... In its entirety Volume 1 contains: 20 chapters, 2 Prefaces, 3 Appendixes, and 35 pages of Bibliography. References, info, data concerning present Volume 1: see introducing text at the top. This chapter 2, above, was translated by Sara L.W. Stern and Ove von Spaeth. - Revised and approved by Ove von Spaeth. Historical and astronomical research - and updating: Copyright © 2006 (& © 1999; © 1984) by: Ove von Spaeth. All text and editing - and updating: Copyright © 2006 (& © 1999; © 1984) by: Ove von Spaeth.